BARE ROOT TREES AND HEDGING, what you need to know. Well bare root plants are just that...bare plants with no pots or soil, we grow them in the ground and lift them as required. This is done during the 'dormant season', when plants are not growing and they can be easily transplanted, generally November to March. Planting bare root is cheaper, easier and faster than planting container-grown plants and the plants also establish and grow very quickly. As a general rule, hedging should not be left out of the ground for too long so that the roots don't get a chance to dry out. Have the ground prepared in advance, calculate the correct spacing and then purchase your plants. 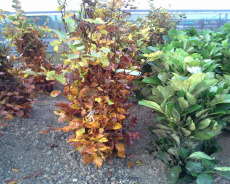 It is imperative to ask for advice when choosing the type of hedging as there are many factors involved in this decision, call or visit the nursery here to talk to us. Call Orla on 086 1002187 for more prices and info.